BRISTOL - The Bristol Eastern football team snapped a 17-game losing streak against Newington at home last season. This time around the Indians weren’t going to let another loss ensue. 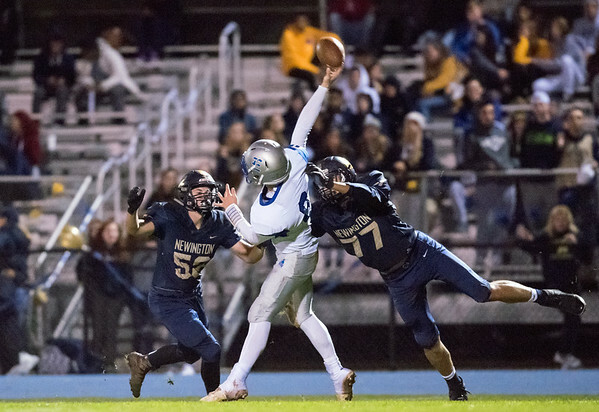 Newington defeated the Lancers 25-7 on Friday night behind a pair of strong first half drives that resulted in touchdowns and added another two scores off of Bristol Eastern mistakes, which set the Indians up in the red zone both times. Despite the 18-point differential, Newington head coach Jason Pace knew his team left a lot of points on the field. Newington starting quarterback Nicholas Pestrichello finished off a strong first drive of the game for the Indians with a 3-yard touchdown pass to Izayah Ciarcia. Then on the second drive Pestrichello found Gunnar Johnson for an 8-yard touchdown pass. The two scores led to a 13-0 lead with 2:59 to go in the first quarter. With receiving weapons such as Ciarcia and Johnson to go with Dylan Nees-Fair on the ground, Pestrichello has settled in nicely as the starting signal caller. It was a balanced offensive attack for Newington. Nees-Fair finished with just over 100 rushing yards in the game and Pestrichello threw for just over 100 passing yards. The third and fourth touchdowns for the Indians came off Bristol Eastern turnovers. After a Bryce Curtin interception, the Indians went up 19-0 as Pestrichello found Ciarcia for his second receiving touchdown of the game. Late in the second quarter the Lancers punt returner Jaden Laprise muffed the kick and Newington recovered on the Bristol Eastern 19-yard line setting it up in position for a big score before the half. Pestrichello found Ciarcia again in the end zone, this time a 4-yard touchdown pass for the third connection between the two coming with 0:18 left in the first half. Newington entered the half with a 25-7 lead. Bristol Eastern’s defense was strong all game long but specifically in the second half held the Indians off the scoreboard and forced three straight punts in the second half and then stopped Newington on a 4th and 7 opportunity. The Indians had just 39 yards offensively on their first three drives in the second half and then strung together a 49-yard drive on their final possession of the game. Offensively Bristol Eastern struggled mightily all game long. Junior starting quarterback Bryce Curtin had four interceptions in the game and couldn’t figure out the Newington defense. Curtin’s strongest drive came on a possession that the Lancers started from their own 23. He connected with Elijah Gagliardo four times on the drive and capped it off with a 14-yard touchdown to his fellow junior. Senior returning starting quarterback Justin Marshall was active for the Lancers and started on defense but didn’t get any snaps offensively. Posted in Newington Town Crier, Newington on Friday, 12 October 2018 22:17. Updated: Friday, 12 October 2018 22:20.